Julian Stephens Goldsmith has produced this exquisite example of a hand raised, elegant tea service which creates a beautiful and unique piece of sculptural design perfect for the modern home. 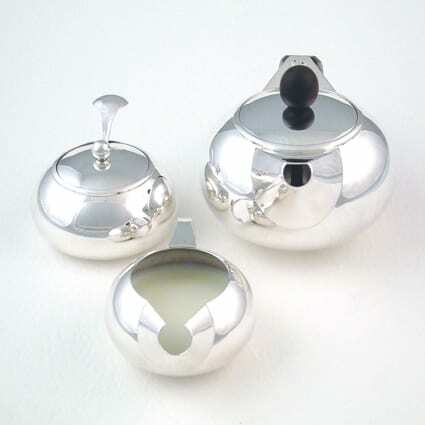 The Ovoid tea service is a fine example of Julian’s skill as an Artisan and Artist, hand raised from solid Sterling Silver meaning the round, domed elements of this incredible piece was created with expertise and skill from hammering and carefully shaping a flat piece of precious metal. This beautiful sculptural Ovoid tea service makes an elegant, contemporary centrepiece for any table but is also packed with thoughtful design and functionality. The Ovoid consists of a tea pot, milk jug and sugar bowl with spoon. Each piece is expertly crafted from 925 Sterling Silver which has been alloyed to ensure it is both stainless and dishwasher safe. To create your own unique piece of opulent homeware please contact us to begin an exciting, special bespoke commission of your own.